As one of the best Blu-ray/DVD ripper programs, Pavutbe BDMagic provides not only practical utility to convert Blu-ray/DVD content, but also simple and easy to use operations. With it, you can easily rip and convert Blu-ray to video in nearly all popular file formats. The converted files could be played on most popular video players for on the move enjoyment. Start this Blu-ray Ripper program. Click “Load Disc” on the menu bar if you want to rip Blu-ray/DVD to video. 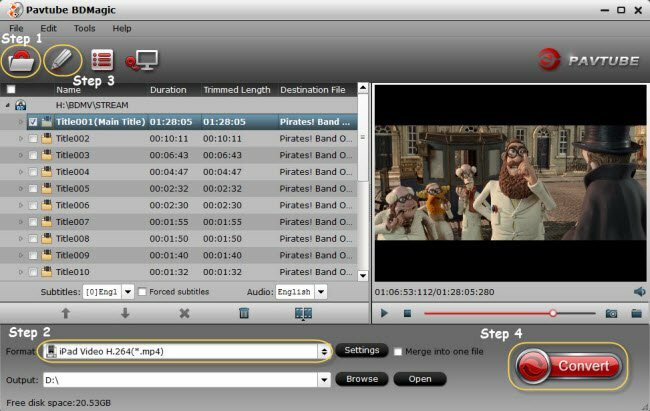 Source subtitles and audio tracks could be selected here. You can also watch source files via built-in player. Click “Format” bar and select the format you want from the drop-down list. Just below Format is Output, here you can browse your computer for a better destination folder for BDMagic to output your converted movies. Click the “Convert” button on the right bottom of the main interface to start converting Blu-ray/DVD to video. After conversion, you can transfer the converted files to your devices or players for unlimited playback. Enjoy Your Blu-ray/DVDs Anywhere!